TimeZone : Blancpain » A new blue dialed Fifty ? 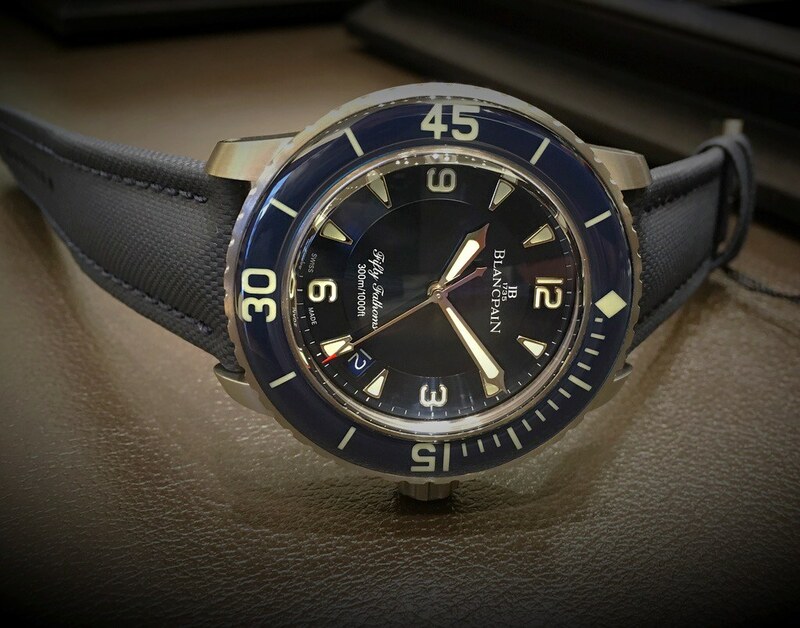 I see on it's website, Blancpain has added a very attractive, non Flinque, blue dial Fifty Fathoms. It retains the same brushed case and it shown on a sailcloth and on a Nato. If they were to offer it on a fully brushed bracelet, I'd leap on it. Whilst I love the Flinque, ( Am I correctly spelling that ? ), in the showroom, I don't think I'd love it on the wrist. Ah, I see also that its titanium, not steel, so I guess the bracelet isn't on the cards, though it makes me love the watch even more ! ... during this years Baselworld, it did not get a lot of coverage, though. As you see, it still comes on the sailcloth strap, I am positively surprised that Blancpain now features a Nato strap (although without the hardware we know from the Bathyscaphe). It's a very beautiful blue dial, I would have wished for a darker titanium case, though. Did you notice whether it had an open or closed casebook ? ... and the rotor decorated as we know it from the Bathyscaphe and also Tribute to MilSpec. It has the original size of the Fifty Fathoms, 45mm x 15,4mm, and it has a sapphire back to admire the movement. I truly love titanium as a case material, the not too heavy watch in steel will become even lighter. It is indeed available with the sailcloth strap too, for the NATO haters. An ideal watch, certainly if you love blue. Blancpain seemingly effortlessly nailed it, again! You have to scroll to the right until you see the blue one at the sailcloth strap. After clicking on it, you see that here also is a picture of the back: it is as you described, a normal rotor as visible on the Bathyscaphe. Blue with Titanium is right down my alley. certainly kinda tempting in the titanium! I adore it so. The non-Flinque dial is IMO more pleasing to the eye and probaly truer to the more utilartarian origin of the first FF. Blue however, is not a color I buy many watches in...and the 45mm size is still a touch bigger than I care to go. If only they executed a FF in a black dial, in SS or Ti...in 42mm. I'd make the call instantly! Original FF size, blue (a big hit with watch dial colors) but without the Flinque dial (less blingey), titanium (lightweight), display caseback. Wow! I assume the movement is the same one in the bathyscape (silicon components etc etc), and not the one in regular FF. Can anyone confirm? Add my name to the interested list. Would love to see the dial and the movement! Next Topic: Which is your favorite Bathyscaphe?